I’m a cognitive psychologist who studies language comprehension. If I see an ad for a vacation rental that says “Your going to Hollywood!” it really bugs me. But my collaborator, Robin Queen, a sociolinguist, who studies how language use varies across social groups, is not annoyed by those errors at all. We were curious: what makes our reactions so different? We didn’t think the difference was due to our professional specialties. So we did some research to find out what makes some people more sensitive to writing mistakes than others. Writing errors often appear in text messages, emails, web posts and other types of informal electronic communication. In fact, these errors have interested other scholars as well. Several years before our study, Jane Vignovic and Lori Foster Thompson, who are psychologists at North Carolina State University, conducted an experiment about vetting a potential new colleague, based only on an email message. College students who read the email messages perceived the writer to be less conscientious, intelligent and trustworthy when the message contained many grammatical errors, compared to the same message without any errors. And at our own University of Michigan, Randall J. Hucks, a doctoral student in business administration, was studying how spelling errors in online peer-to-peer loan requests at LendingTree.com affected the likelihood of funding. He found that spelling errors led to worse outcomes on multiple dimensions. In both of these studies, readers judged strangers harshly simply because of writing errors. Over the last several years, we conducted a series of experiments to investigate how written errors change a reader’s interpretation of the message, including the inferences that the reader makes about the writer. For our original experiments, we recruited college students to be our readers, and for our most recent experiment, we recruited people from across the country who differed widely in terms of age and level of education. In all of our experiments, we asked our participants for information about themselves (e.g., age, gender), literacy behaviors (e.g., time spent pleasure reading, texts per day), and attitudes (e.g., How important is good grammar?). In the most recent experiment, we also gave participants a personality test. In each experiment, we told our participants to pretend that they had posted an ad for a housemate and gotten 12 email responses. After reading each email, the participants rated the writer as a potential housemate, and on other factors like intelligence, friendliness, laziness, etc. In fact, we had created three versions of each email. One version had no mistakes. One version included a few typos, e.g. abuot for about. Another version had errors involving words that people often mix up, such as there for their (we called these grammos). Everyone read four normal messages, four with “typos,” and four with “grammos.” Different people read the other versions of each message, so that we could separate responses to the errors from responses to the message content. Errors matter – but to whom? In all of our experiments, readers rated the writers as less desirable if the emails included either typos or grammos. We expected this based on the earlier research, described above. In addition, people differed in their sensitivity to the two types of errors. For example, college students who reported higher use of electronic media were less sensitive to the errors, though time spent pleasure reading had no effect. Prior research on writing errors had not compared types of errors, nor collected information about the readers, in order to see which reader characteristics influenced interpretation. Both of these strategies for understanding how errors impact interpretation are unique to our research. Perhaps the most interesting finding is from the experiment in which we gave participants the personality test. It measured the five traits considered to be important in personality research: extraversion (i.e. how outgoing or social a person is), agreeableness, openness to experience, conscientiousness and neuroticism (prone to anxiety, fear, moodiness). This experiment involved adults who varied a lot in age and education, but those differences didn’t affect their interpretation of the writing errors. Unlike the initial study with college students, use of electronic media had no effect. 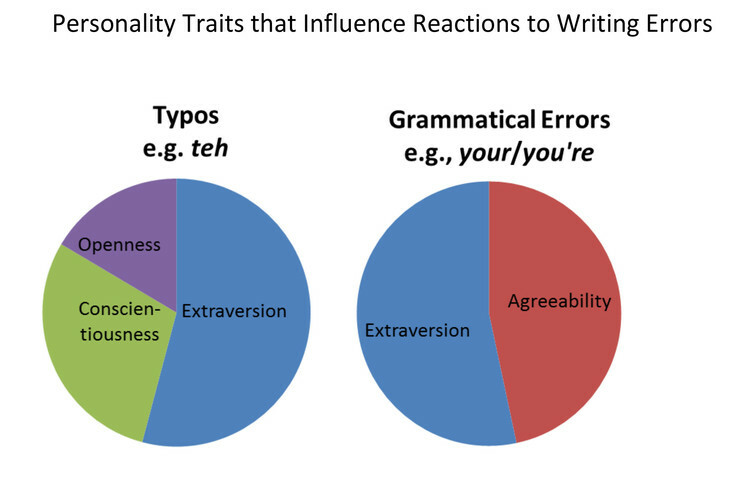 What mattered were the personality traits: people responded to the writing errors based on their personality type. People who scored high in conscientiousness or low on the “open-to-experience” trait were more bothered by the typos. People who scored low on agreeability were more bothered by the grammos. And people who scored low on “extraversion” were more bothered by both types of errors. In contrast, how people scored on neuroticism did not alter the impact of either type of error. Remember, by being bothered we mean that the reader gave lower ratings on the housemate questionnaire to writers who made that type of error. Our findings – that our personality influences our interpretation of a message – complement other research that has found that our personality influences what we say and how we say it. In 2015, Gregory Park and other researchers at the University of Pennsylvania and the University of Cambridge analyzed Facebook posts from more than 66,000 users who had also completed a personality test based on the same five personality traits that we measured in our study. They found the use of words like love, party and amazing are correlated with extraversion, while the words sick, hate and anymore are correlated with neuroticism. This research built upon earlier work by researchers Tal Yarkoni and James W. Pennebaker. While reading our research, two key points need to be kept in mind. First, we think that errors influenced readers' perception of the writer mainly because the writer was otherwise unknown – the short email was the only basis for judgment. Second, we didn’t ask the readers how likely they were to point out errors to the people who make them. So, it doesn’t necessarily follow from our study that your friends will view you more negatively if you don’t proofread your email messages, or that you can predict which people will call you on it based on their personality. But, you might want to keep these findings in mind when you write for an unknown audience or when you read something from someone you don’t know.